As one of their Master Makers Fairfield World provided me with the interfacing used in this project as well as compensating me for this post, but all ideas and opinions are my own. 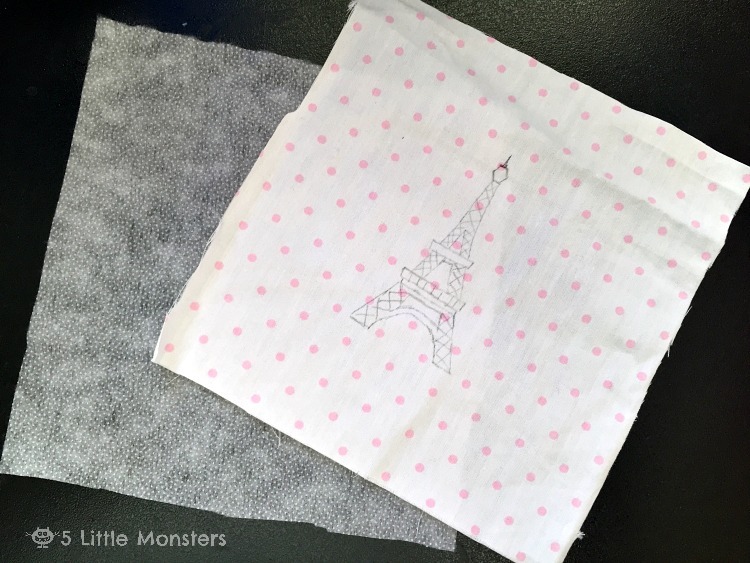 My 7 year old daughter has been obsessed with Paris lately. 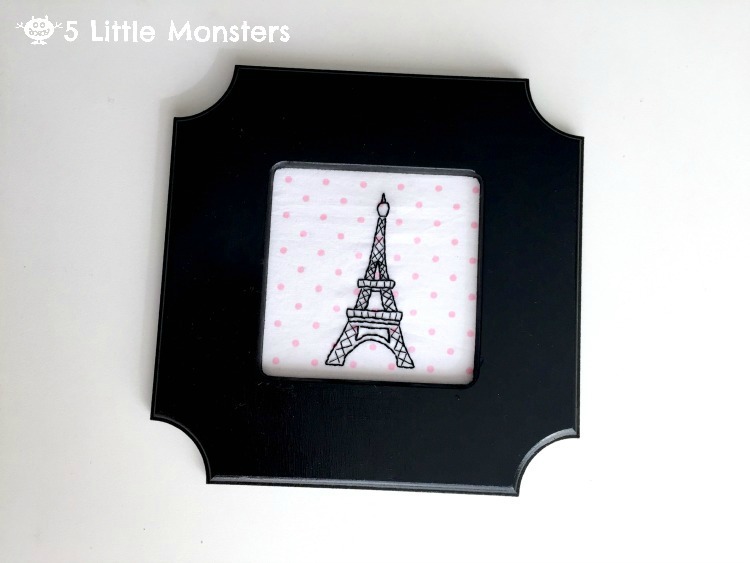 Every time she sees something with the Eiffel Tower on it she points it out to us and starts talking about how much she wants to go to Paris someday. It all started when she got an American Girl Doll for Christmas. I had always been pretty against the idea of spending that much on a doll but fell in love with last year's Girl of the Year doll, Grace, because just like her Grace loves baking. She has always dreamed of having a bakery when she grows up. We ended up deciding to splurge on a Grace doll for her for Christmas and she absolutely loved it. Well, it turns out that in her story Grace also went to France where, I think her grandparents, have a french bakery. The doll comes with a shirt that has the Eiffel Tower on it and I think a lot of the accessories that you can get have a French theme, things like berets and bistro sets. So now we have a little girl who loves everything about Paris and Grace, she even told me the other day that she wishes we had named her Grace. With having a new baby on the way we are going to be changing bedrooms and part of that is finishing an unfinished bedroom in our basement. That room will become Eliza's room, possibly shared with a sister depending on if this baby is a boy or a girl. She loves pink and really wants to have a lot of pink in her room but we also wanted it to be something she can kind of grow into, not too little girly and cutesy. We have decided we are going to decorate it with a Paris theme with the main colors being light pink, black, white, and a little bit of silver. We aren't quite ready to start working on the actual room but since we kind of know what we want to do as far as colors and theme I have started working on a few projects to decorate her room. One of the things that I want to do in her room is a sort of gallery wall with some girly quotes and other things mixed in. I have already made a couple of things that I plan to have as a part of that wall. 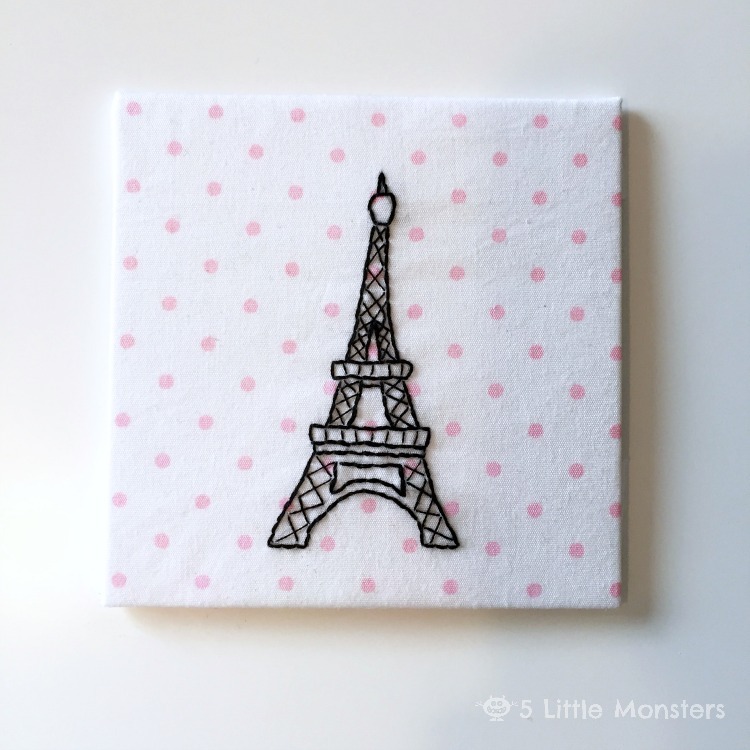 First is this little Eiffel Tower embroidery. I have had this little frame sitting around for almost a year trying to decide what to do with it. I got it last year when I attended Snap Conference, one of the sponsors was Cut it Out, a company that makes wooden frames. I don't think you can actually buy this size from them, I think it was a size they did just to hand out as swag at the conference, but I have seen similar sized frames other places. The opening is about 3 1/2" x 3 1/2", I think it is made to hold a 4"x 4" picture but the front opening is 3 1/2" square. The Eiffel Tower is about 3" tall so you will need something a little bigger than that. I painted the frame with a glossy black paint, I started with a matte paint but decided it needed something a little more interesting so I picked up some glossy paint and I was much happier with that. 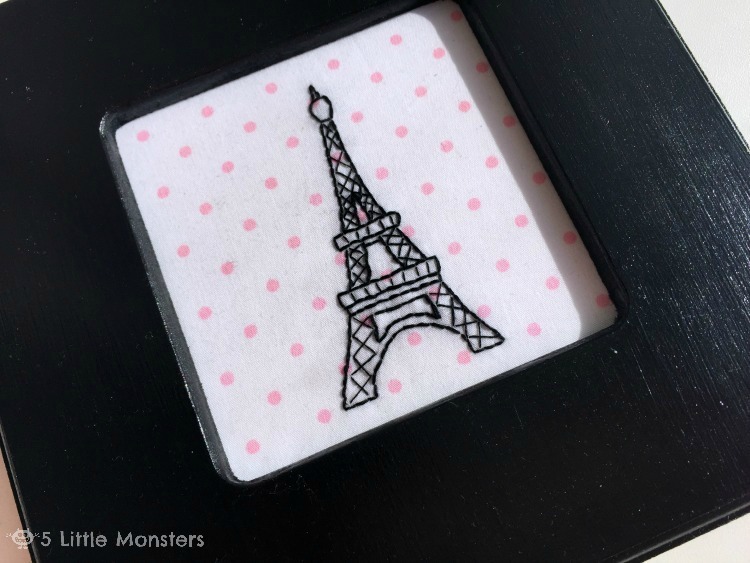 To make the Eiffel Tower I just drew a little sketch of the Eiffel Tower, I wanted to keep it simple and small and I wasn't really worried about it being perfect. I had originally planned on using plain white fabric to embroider on but then I saw a scrap of white with pink polka dots and I thought that would be perfect and would bring in just a little bit of pink so I decided to go with that. 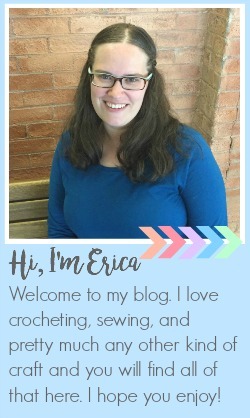 Because I was using a light colored fabric and dark thread I wanted to make sure that I did something so that the threads on the back wouldn't show through the finished project. To solve that problem I decided to use some lightweight fusible interfacing from Fairfield World. It added stability to the fabric and helped make it so that the threads could be seen through, but it didn't add any bulk which was really nice. To finish I just wrapped the fabric around the cardboard that came with the frame and taped it on the back to hold it in place. Then I placed the finished embroidery in the frame and it was done. Because it is such a small embroidery it was a really quick project but I think it is going to look great on the wall of her new bedroom. 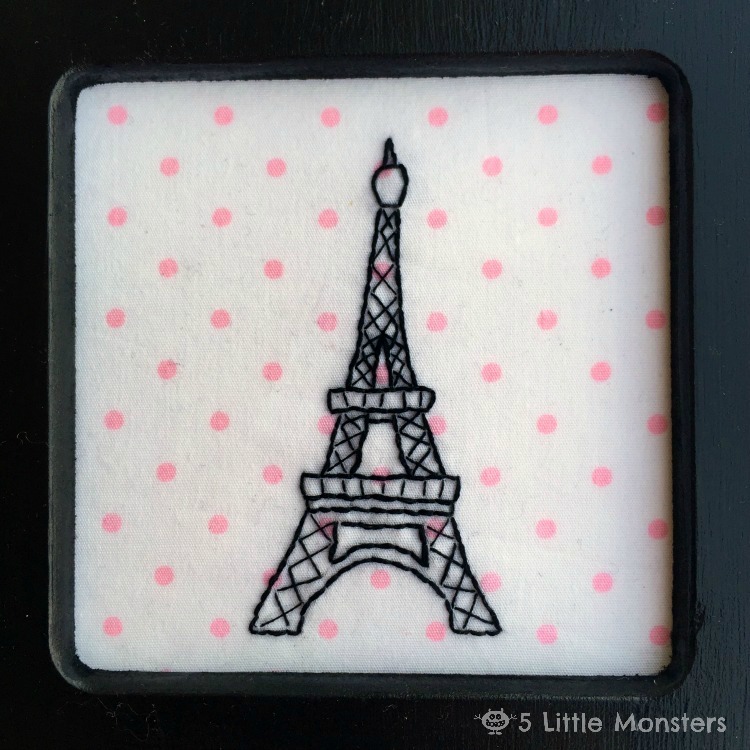 Trace the Eiffel Tower in the center of the fabric square. Iron the interfacing on the back of the fabric. 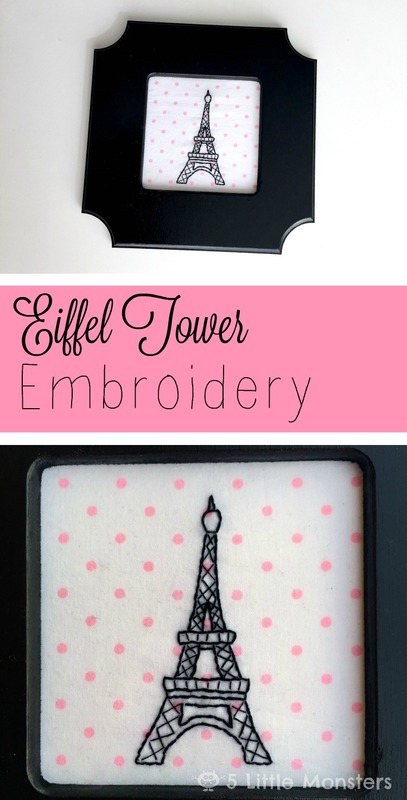 Using black thread embroider the Eiffel Tower. 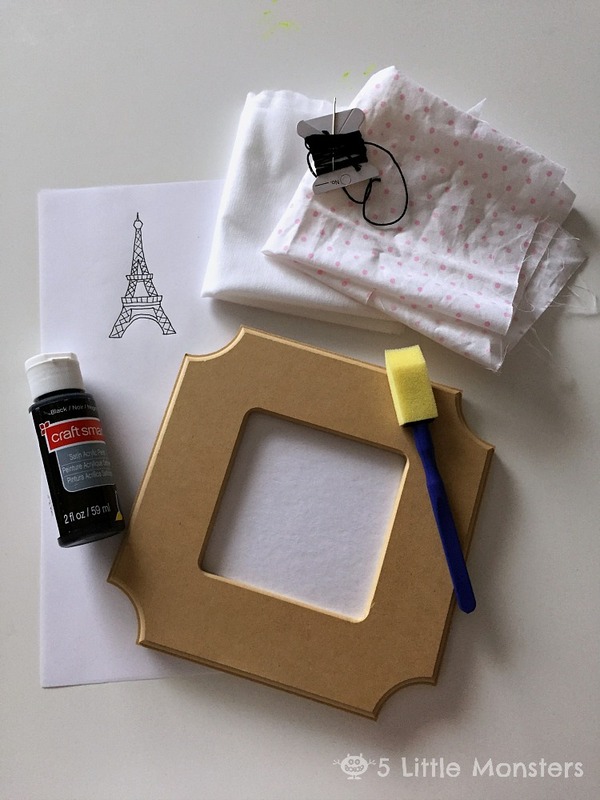 Use 2 strands for the outline of the Eiffel Tower, everything but the x's on the inside and the the vertical lines inside the bars across the middle, use 1 strand for those parts. Use backstitch for the outline and cross stitches for the x's. Wrap the fabric around the board that fits inside of the frame, tape or glue it in place. Prepare the frame by painting it, you may need to use multiple coats. Let dry. When the frame is completely dry, insert the board into the frame and secure. That's it, your embroidery is ready to hang on the wall. It is a super simple project that can be finished in no time. The embroidery is so small that it works up really fast.